Before I get to that though, recognise that there are many ways to get over your nerves and anxiety. Practice will naturally be one of those strategies. You just can’t beat practice and years of developing your craft. With competence (skill level) comes confidence. But what to do if you find yourself in a room full of people and you can’t remember what you were going to say. Your mind has gone blank. Well, evolutionarily speaking there is a good reason for this. It’s to do with your three brains. Three brains? Yes. You might think you just have one. Or perhaps two (a left hemisphere and a right hemisphere). In actual fact you have three brains. All wrapped up into one. They go by different names but here’s how I describe them. Nice and simply. 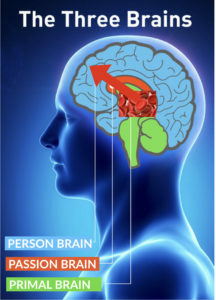 The PRIMAL part of the brain is the part that formed first. It is responsible for your basic life survival and development functions. Heart beat, hunger, defending territory, breathing, fight or flight response, body temperature, balance. Some other experts might call this the reptilian (R-complex), lizard or dinosaur brain. I like to call it the PRIMAL part. The PASSION part of the brain is also known as the limbic system. Responsible for mood, memory, hormone control and similar such features. It’s what we share with other mammals. Dogs, cats, horses and mice even. The main structures of the PASSION part (limbic brain) are the hippocampus, the amygdala, and the hypothalamus. 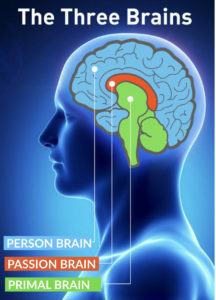 The PERSON part of the brain is what is unique to us humans and some other primates. It’s also thought of as the pre-frontal cortex, parental lobe and executive function. With this PERSON brain, primates and us humans can do things that horses and cows cannot, like complex social interactions and advance planning (such as planning an attack on a neighbouring troop, human language, abstract thought, imagination, and consciousness). 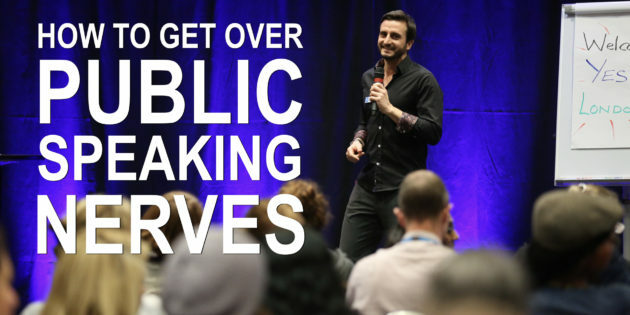 And also, in the case of us humans, public speaking. Or taking exams. Complex problem solving. Here’s the thing though, and why understanding about the three brains is pivotal to get over anxiety and nervousness. No, of course not. We need to RUN! Climb a tree or rock, jump into a river, or get as far away as possible. All our blood diverts to places that need focus. Like our legs, heart (not our stomachs – hence why you shouldn’t eat while stressed). 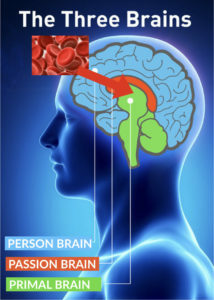 In terms of the brain, the blood flow goes to the PRIMAL part of the brain. Away from the PERSON part. Because it’s all about survival. Here’s the thing though. If you’re not very seasoned as speaking (or even if you are) but you’re getting nervous, you start to enter that fight or flight phase. You blood flow goes from PERSON to PRIMAL. You think you have a room full of sabre tooth tigers staring at you in the face. When you don’t of course. But your PRIMAL brain thinks so. So you can’t string a sentence together. How do you get blood flow from the PRIMAL back to the PERSON part of the brain. But not into the upper chest or through the mouth like most people breathe day to day. Deep, slow breaths into the diaphragm. Think about it as “belly-breathing”. Breath so that your belly expands first. Breath in through your nose. Breath out longer than you inhale. This will start to get blood flowing from PRIMAL back to PERSON. And then you will be able to speak clearly again. Do this before you get in front of people. Or before an important event like a driving test, exam or business pitch. Does that make sense? Does it help? Please share, comment and like if you found this useful so that others might also find this article and benefit.